Lamar University students enjoy cheering on the Cardinals in more than a dozen NCAA Division I men’s and women’s sports. Competing in the Southland Conference, Cardinals teams have a history of winning championships in sports including men’s and women’s basketball, volleyball, golf and cross country. The baseball program, led by legendary Coach Jim Gilligan, has produced multiple major leaguers. 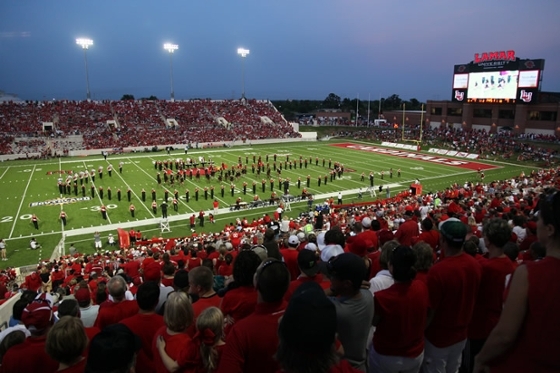 LU’s new football program has heightened excitement on campus with sell-out crowds and students involved in marching band, cheerleading, the dance team and all the fun of game-day tailgating. LU has recently added two new athletic programs for female athletes: soccer and softball. Lamar has some of the finest athletic facilities in the region. Most recently, the Dauphin Athletic Complex was completed, housing the Lamar football team as well as other athletic administration. The 54,000-square-foot facility lies at the south end of newly renovated Provost Umphrey Stadium. The complex contains football locker rooms, weight training and sports medicine facilities and academic centers. The Montagne Center, which opened in 1984 and has a seating capacity of 10,080, is one of the premier basketball arenas in the country. Vincent-Beck Stadium, home of the Cardinal baseball team, hosted the 1993 Sun Belt Conference tournament, and the 2001, 2002 and 2006 Southland Conference tournaments. The LU Soccer Complex opened in 2009 and is one of the top facilities in the Southland Conference. The Lamar Tennis Facility, now named the Thompson Family Tennis Center, received a total renovation in 2009. The Ty Terrell Track, which was resurfaced in 2001, is the site of the Ty Terrell Relays, which annually attracts some of the best prep and collegiate track athletes. When the McDonald Gymnasium opened its doors in 1958, it immediately became a campus landmark. It was the home of basketball, volleyball and high school sports. Today, following a major renovation in 2006, it is the competition venue for Lamar University Volleyball and is housed within the Sheila Umphrey Recreational Sports Center.